The question at the heart of Cheap Thrills, the debut feature of director E.L. Katz, is a relatively simple one: If pushed, what are people capable of doing for money? In that respect, it feels like the darker, dirtier cousin to Adrian Lyne's Indecent Proposal, but instead of depicting a situation in which a billionaire pays a million dollars to sleep with another man's wife, Cheap Thrills shows what happens when people are so desperate that they'll do anything to pay the rent, no matter how violent or disturbing. After being fired from his job as a mechanic, Craig (Pat Healy) goes to a bar to drown his sorrows and to delay the moment when he will have to explain to his wife and child that they've got no money coming in, and that they're on the verge of being evicted. His plans are waylaid by the arrival of his high school friend Vince (Ethan Embry), who is similarly down on his luck. They meet Colin and Violet (Dave Koechner and Sara Paxton), a rich couple who buy an expensive bottle of tequila, then offer to pay $50 to the first person to down a shot of it. This relatively innocuous task marks the beginning of a series of dares that get gradually weirder, darker and more violent as the night progresses, and as Craig and Vince find their friendship fraying in the face of greed and desperation. It's not hard to see Cheap Thrills as a pretty bleak metaphor for the worst excesses of capitalism, a system that forces people to do degrading things in order to stay alive, and in which the poor are at the mercy of forces beyond their control and the whims of the rich. It's a fairly grotesque examination of that idea, but it's still a potent one, largely because Katz and his cast make this worst case scenario seem credible. The progression from the mild transgressions of the early bets, which primarily revolve around instigating conflicts with strangers or making Craig and Vince play pranks on each other, to the later ones is handled well, with each bet steadily building on the one that went before. If you take the first and last dares and look at them in isolation, the distance seems unbridgeable, but in context the path between the two seems not only possible, but logical. 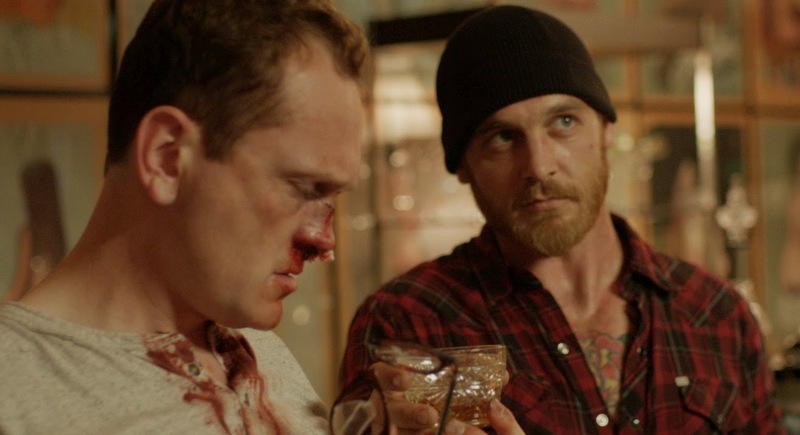 The film works largely because Healy and Embry give performances that are believably desperate to begin with, but they also suggest the underlying bitterness that would drive them to compete against each other for small but potentially life-saving amounts of money. Cheap Thrills would still be darkly funny and entertaining if it was merely a thought experiment, a thoroughly worked out "what if" scenario designed to examine the darker impulses of humanity and the lengths people will go in order to get a moderately better life. What makes it compelling, though, is the dynamic between two old friends who harbour deep-seated resentments and grudges which inform their desire to keep playing games for a couple who they know will keep pushing them to further and further extremes. It's not just an interesting concept, but an interesting drama. Koechner and Paxton, meanwhile, make that couple believably awful yet enticing. The affability Koechner displays as Champ Kind in the Anchorman films is on full display here since he never stops finding everything around him incredibly amusing, yet it's backed up by the implied menace of his imposing frame. Paxton, meanwhile, plays Violet as bored and detached, which makes her occasional contributions to the chaos feel all the more unpredictable. All four leads are great and essential to the success of the film since, barring a few scenes here and there, they are the only people on screen, and they have to juggle the shifting allegiances, schemes and conflicts on their own. The script by David Chirchirillo and Trent Haaga does a lot to make their dynamics feel real, but it cannot be overstated just how well the cast bring those words to life. The films walks a fine line between being grimly entertaining and outright unpleasant, particular as it moves further away from the realm of Indecent Proposal and more towards Roald Dahl's "The Man from the South", but even at its most violent and disgusting it still has a mischievousness that stops it from being unpalatable. It's an impish, knowingly perverse journey into darkness that is as devastating as it is funny, and anyone who is in the mood for pitch black laughs could do far, far worse than Cheap Thrills.